In the early morning of 23 October 1944 both DARTER and DACE contacted and tracked a large enemy force heading north through Palawan Passage enroute to engage our forces in the Battles for Leyte Gulf. They attacked while the enemy were unable to alter course appreciably, and in brilliant pre-dawn submerged attacks, sank the heavy cruisers ATAGO and MAYA, and so severely damaged the heavy cruiser TAKAO that she was useless for the rest of the war. During daylight, DARTER tried a submerged attack on TAKAO, which bad been stopped, but was driven off by screening destroyers. Thus a night coordinated attack plan was drawn up by the two boats. Since she could not surface to take sights, DARTER was forced to navigate on a 24-hour-old Dead Reckoning plot. At 2200 TAKAO got underway, and DARTER began a surface attack. Detecting two radars sweeping, she decided to do an end around, and then make an attack at radar depth. At 0005 on 24 October 1944, DARTER grounded on Bombay Shoal, and, making 17 knots at the time, rode up to a draft of nine feet forward. Efforts to get off the reef were unsuccessful, and a message was sent to DACE requesting assistance. DACE closed DARTER and, after confidential gear had been smashed and classified matter burned, the men of DARTER were transferred to DACE. This was all done before dawn, and there were no losses of DARTER personnel. DARTER's demolition charges failed to go off properly, and DACE used her remaining torpedoes in trying to destroy her without success, the torpedoes hitting the reef and exploding before they could reach their target. She did, however, score 21 four-inch hits on DARTER. ROCK was called in and fired ten torpedoes at DARTER, with similar lack of success due to their hitting the reef. NAUTILUS, on her 13th patrol, arrived on 31 October 1944, and scored 55 six-inch hits on DARTER. Her report states, "It is very doubtful that any equipment in DARTER at 1131 this date would be of any value to Japan - except as scrap. Estimated draft of DARTER - 4 Feet". It must be realized that Commander McClintock understood fully the dangers involved in the end around maneuver in which DARTER grounded-indeed, the incident is a classic example of calculated risk, and he was not held in any way at fault in the incident. It was simply one of the unfortunate tactical losses which must be expected in wartime, but which, in this case, was minimized by the fact that DARTER's full complement of personnel was saved. In order to keep this fighting and successful crew together the entire DARTER crew was ordered to take over the submarine MENHADEN, then building at Manitowoc, Wisconsin. DARTER's four patrols (including her last) resulted in 23,700 tons of enemy ships being sent to the bottom, and 30,000 tons being damaged. She began her patrolling career south and west of Truk in January and February 1944. She damaged a freighter on this first patrol. 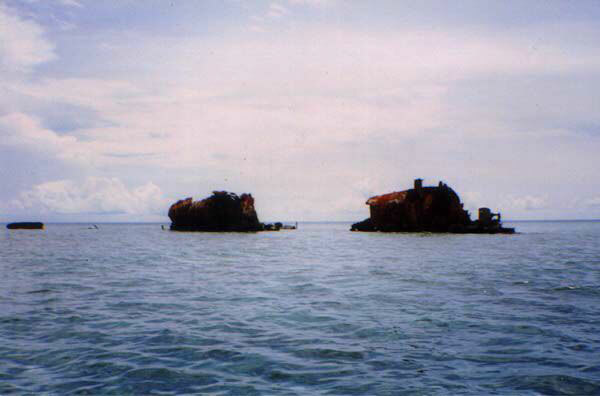 In the second patrol of this vessel, she covered the area in and around the Celebes Sea; she sank a freighter here. DARTER's third patrol was again in the eastern Celebes Sea, and she sank the large mine layer TUGARU on 29 June 1944. She was credited with sinking the heavy cruiser ATAGO and damaging the heavy cruiser TAKAO on the night of 23 October 1944, shortly before she stranded. DARTER was awarded the Navy Unit Commendation for the last patrol. Please note -- the wreck of USS Darter remains to this day on Bombay Shoal, although little remains of her rusted hulk.